Go to any Magruder track meet this year and it won't be long before one athlete catches your eye. Slim, toned, and towering above his teammates, Darius Ray is almost as robust as he is candid. The three sport athlete returns this outdoor season to win and break records. 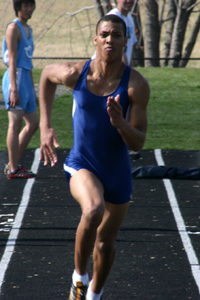 If Tuesday's meet was any indication, 2008 holds a rewarding outdoor track season for him. Ray began the meet by winning the long jump with a mark of 20 feet and 8 inches. He was talkative with anyone around him: his teammates, his opponents, the event officials. He poked fun at people whenever appropriate, and gave helpful advice wherever he could. It would be over an hour before his next event, but you never would have known it by watching him. He never put on his warm-ups, and he never sat down. He was everywhere at once, all the while helping out anyone who needed it. His teammates needed help with hand offs. He was on it. The girls were high jumping. He was there. Eventually it was time for him to triple jump. He was not shy about his attempt on the school record of 44 feet. He was not reserved when he broke that record by several inches. Despite the fact that he had the entire season to break records, he badly wanted the record immediately, and he let people know it. Soon thereafter, he anchored his team's 4x400-meter relay. He says that he usually never sprints that long of a distance, but loves the thrill of chasing after someone in front of him. He got his chance to chase someone. After multiple lead changes, Clarksburg's Mark Small got the baton several strides in front of Ray. Ray made up some ground, but since Small is one of the better sprinters in the county in his own right, Clarksburg came away with the win. Magruder finished several seconds back. For Ray, it was the thrill of the race that overrode any feelings of disappointment or fatigue. Just when everyone thought the meet was over, Ray ran over to the high jump pit to grab some free points for his team. Coincidentally, the entire Clarksburg team had gathered there for a pep talk before getting on the bus. The Clarksburg athletes cleared away from the mat and turned their attention to Ray. Ray thrived off the audience's attention. He effortlessly floated over 5-4, then 5-6, then 5-8 with almost no rest in between. With no volunteers around, he actually raised the uprights himself! He missed his first attempt at 5 feet and 10 inches. His coach made him call it quits. He was the first athlete jumping, he was the last athlete jumping, and he was the only athlete who didn't sit down for four hours. Such work ethic is typical of the star Magruder athlete according to head coach Nathan Timm, but only scratches the surface of who Darius Ray really is. This guy is to good to be true. tony wu in the backround!